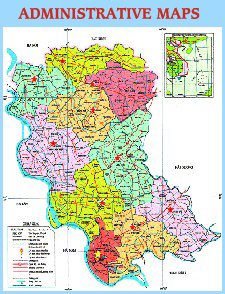 Hung Yen’s administrative map is a miniature painting of its administrative territory drawn under some strict mathematical rules by using a system of signs, colors and notes which are built in compliance with the regulations of Ministry of Natural Resources and Environment. The map contains the contents of natural and socio- economic conditions as well as the political, economic, cultural and social centers in detail. The specific explaination and harmonious lay-out help readers to look back on the spatial distribution between field and map. Hung Yen is located in the center of Northern Delta and in Key Economic Zone to the North. * From 20o36 ' to 21o01 ' northern of latitude. * From 105o53 ' to 106o17 ' eastern of longitude. The total natural area is 92309.32 hectares (923.09 km2), accounting for 6.02 % of the Northern Delta area. It is a flat area with no forests, mountains and seas. It consists of 10 districts with 161 communes, wards and towns. Hung Yen City is the political, economic and cultural center of the province. 2. Expression of transport system. The diversified waterway and road traffic system is very convenient for transport and plays an important role for rapid economic development of the province. On the map, colors and symbols are used to note the streets' name. Railway: There is Ha Noi - Hai Phong railway route from Nhu Quynh town to Luong Tai commune (Van Lam district), which is 17km long. Highway, provincial, district and inter-village roads: They are well developed and rationally arranged in all communes, wards and towns. Cars can easily go to the communes' center. * Highway No. 38: Tranh drain - Truong Xa, Hung Yen town - Yen Lenh Bridge. * Highway No. 38B (previously called 39B): Cau Trang – Gao Market. Provincial road: Some routes such as 195, 196, 199, 200, 204, 205, 205C, 206, 209, and other routes are displayed with noted names and red color on the map. Traffic infrastructure network in general and road traffic in particular are shown rationally on the map. Roads are classified into national, provincial, district and village ones, which forms reasonable road traffic network and facilitates the circulation in the province and with other provinces. 3. Expression of irrigational system. Rivers, canals, drains, bridges, dykes and other irrigational systems used for agricultural production and daily life are displayed with symbols and colors. On the map, it is seen that the province's irrigational system is fully-constituted and evenly arranged in each administrative unit. 4. Expression of residential system by administrative units. Symbols and colors are used to show the population distribution by administrative units such as wards, communes, hamlets, villages and letters are used to note the name of 10 districts and town with 161 communes, wards and towns. The color system is used to note the administrative centers of the province. 5. Expression of material facilities system by administrative units. Material facilities system: Hospitals, clinics, schools, radio stations, television stations, post offices, factories, martyrs’cemeteries, monuments, water pumping stations, temples, pagodas, churches, and landscapes are displayed by a system of explained symbols and colors. The above factors are fully displayed in each administrative unit.